East Street Weather Blog Huntington weather every day! This morning in Huntington at 8:30AM it’s currently 64 degrees under mostly cloudy skies. Winds are calm. Relative humidity is 91%, dewpoint 61, barometric pressure 30.02″. Yesterday’s high was 75, and the overnight low was 53. A potent upper level disturbance will mover into the region today. We’ll see mostly cloudy skies with numerous showers and thunderstorms this afternoon. Some thunderstorms may produce gusty winds and small hail this afternoon. Highs will be in the lower 70s with south winds around 10 mph. Chance of rain is 70%. Tonight should be partly cloudy with isolated showers until midnight. Lows will be in the mid 50s with light and variable winds. Chance of rain is 20%. Friday should be partly sunny with a slight chance of convection-based showers and thunderstorms in the afternoon. Highs will be in the upper 70s with south winds around 10 mph. Chance of rain is 20%. Friday night should be partly cloudy with lows around 60 and south winds around 10 mph. Saturday’s looking mostly cloudy with a chance of afternoon convective showers and thunderstorms. Highs will be in the mid 70s with light and variable winds. Chance of rain is 50%. Saturday night should be mostly cloudy with lows in the upper 50s. Last year on this date we had a high of 79 and a low of 52. The record high was 96°F in 1999 (we had a high of 92). The record low was 42°F in 1964. The Moon is a waxing crescent (quite lovely yesterday evening!) 4d 13h old with 18% illumination. The ornamental thistles in our flower garden are quite popular with the local pollinators right now. 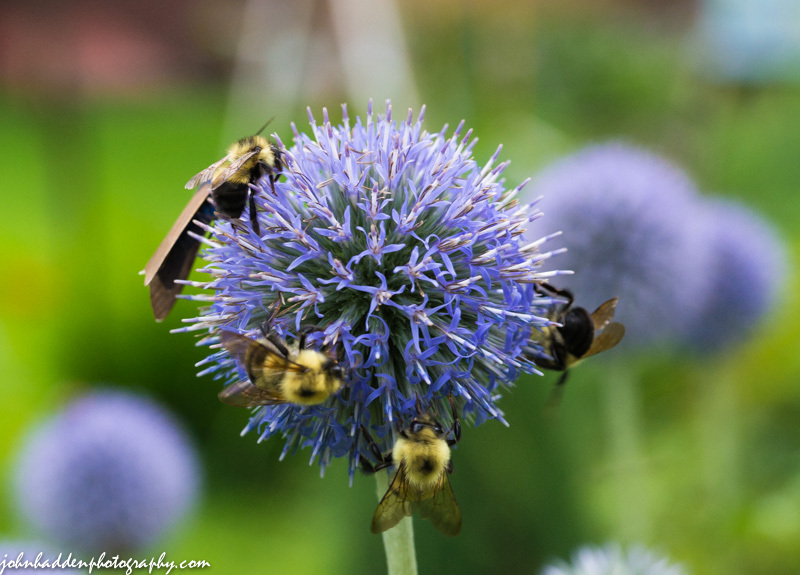 Each of the dozens of flower head hosts a busy collection of bees and other insects. Nikon D600, Sigma 105mm lens, ISO 1250, f/13, 1/60″ exposure. This morning in Huntington at 7:00AM it’s currently 49 degrees under mostly cloudy skies. Winds are calm. Relative humidity is 99%, dewpoint 49, barometric pressure 30.00″ and rising. Yesterday’s high was 70, and the overnight low was 46. A low pressure system parked over northern Ontario will pivot cool air along with a series of upper level disturbance through our region for the next several days. We’ll see partly sunny skies today with a slight chance of showers and thunderstorms this afternoon. Highs will be in the lower 70s with light and variable winds. Chance of rain is 20%. Tonight should be partly cloudy with a slight chance of showers until midnight. Lows will be in the mid 50s with light and variable winds. Chance of rain is 20%. A more powerful disturbance will roll through Thursday bringing shows and thunderstorms mainly in the afternoon. Highs will be in the lower 70s with south winds around 10 mph. Chance of rain is 70%. Thursday night should be partly cloudy with a chance of showers and thunderstorms. Lows will be in the mid 50s with south winds around 10 mph. Chance of rain is 50%. Friday’s looking partly sunny with a chance of showers. Highs will be in the upper 70s with south winds around 10 mph. Chance of rain is 30%. Friday night should be partly cloudy with lows in the lower 60s. Last year on this date we had a high of 74 and a low of 52. We picked up 0.02″ of rain. Burlington norms for this date are highs of 81 and lows of 60. The record high was 96°F in 1959. The record low was 45°F in 1952. The Moon is a waxing crescent, 3d 12h old with 11% illumination. 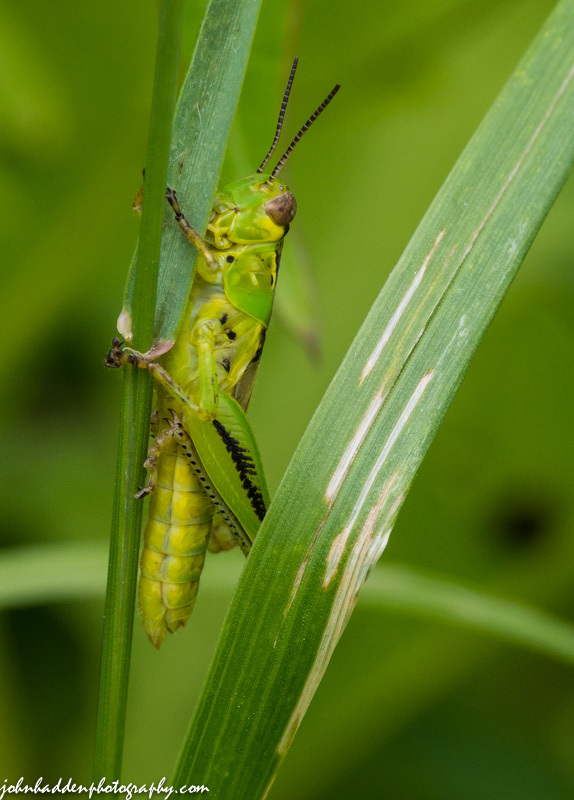 This young grasshopper was trying to hide from me in the grasses of our front field. He was only about an inch long, so had probably recently emerged. Nikon D600, Sigma 105mm lens, ISO 1250, f/16, 1/400″ exposure. 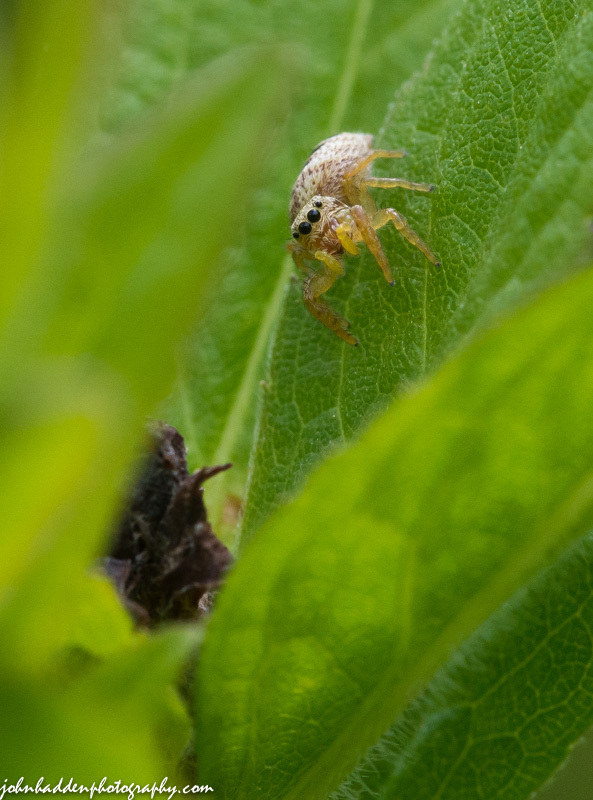 Another small jumping spider out in the front field. This morning in Huntington at 6:20AM it’s currently 54 degrees under mostly cloudy skies. Winds are calm. Relative humidity is 97%, dewpoint 53, barometric pressure 29.72” and rising. We picked up a good soaking 1.36” of rain in the past 24hrs. Yesterday’s high was 68, and the overnight low was 53. With the low that brought us yesterday’s soaking rains departing to our east this morning, we’ll see partly sunny skies today with highs in the lower 70s and northwest winds around 10 mph. Tonight should be mostly clear with patchy dense fog after midnight. Lows will be in the lower 50s with light and variable winds. Wednesday should be partly sunny with patchy dense fog in the morning. Diurnal heating may bring the slight chance of a shower thunderstorms in the afternoon. Highs will be in the mid 70s with light and variable winds. Chance of rain is 30%. Wednesday night should be partly cloudy with a chance of showers. Lows will be in the mid 50s with light and variable winds. Chance of rain is 40%. A cold front will swing through on Thursday bringing the likelihood of showers with a chance of thunderstorms. Highs will be in the lower 70s with south winds around 10 mph. Chance of rain is 70%. Thursday night should be partly cloudy with a chance of showers and thunderstorms. Lows will be in the mid 50s. Chance of rain is 50%. Last year on this date we had a high of 78 and a low of 60. We picked up 1.77″ of rain. The record high was was 98°F in 1949. The record low was 45°F in 1987. The Moon is a waxing crescent, 2d 12h old with 6% illumination. This cagey little jumping spider was playing hide-and-seek with me in the front field. Nikon D600, Sigma 105mm lens, ISO 1250, f/16, 1/500″ exposure. Ant aphid farming in the front field. This morning in Huntington at 6:55AM it’s currently 60 degrees and raining moderately under overcast skies. Winds are calm. Relative humidity is 99%, dewpoint 59, barometric pressure 29.63” and rising. We picked up 0.59” of rain in the past 24hrs but none of the hail that was reported to our north and south. Yesterday’s high was 80, and the overnight low was 57. A strong low pressure system and upper disturbance will bring a welcome soaking rain with embedded thunderstorms to the region today. We’ll see rain with a chance of thunderstorms throughout the day. Some thunderstorms may produce gusty winds and heavy rainfall this afternoon. Highs will be in the upper 60s with light and variable winds. Chance of rain is near 100%. Rain will continue into tonight. Lows will be in the lower 50s with northwest winds around 10 mph. Chance of rain is 90%. We should see rainfall totals in the 1″-1.5″ range before things wind down. Tuesday should be partly sunny with a 20 chance of lingering showers. Highs will be around 70 with west winds around 10 mph. Tuesday night should be partly cloudy with lows in the lower 50s and light and variable winds. Wednesday’s looking partly sunny with highs in the lower 70s and south winds around 10 mph. Wednesday night should be partly cloudy with lows in the mid 50s. Last year on this date we had a high of 77 and lows of 57. The record high was 96°F in 1964. The record low was 45°F in 2001 (we had a low of 49). The Moon is a waxing crescent, 1d 12h old with 2% illumination. “Aphid farming” is a well known phenomenon. 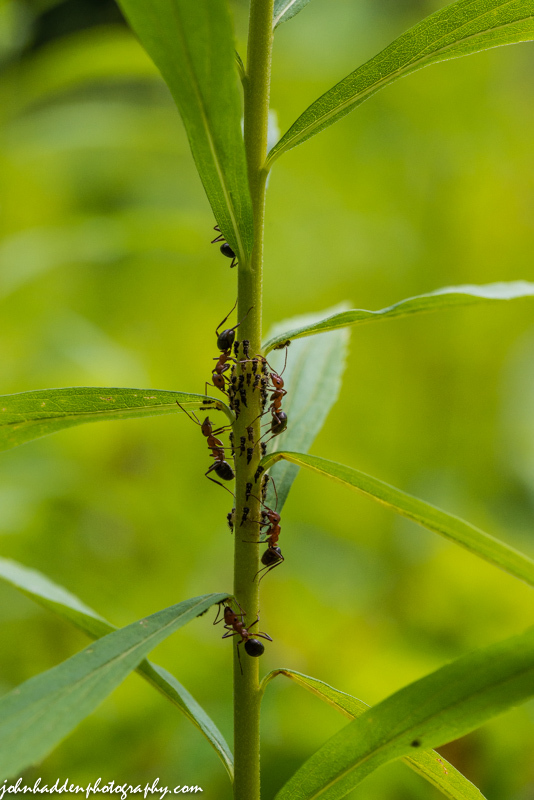 Ants will “corral” groups of aphids and feed off or the sweet secretions that they produce. Studies suggest that the ants use a tranquilizer in their feet to subdue their charges and keep them gathered together. I saw three different varieties of ants out in the front field the other day farming. Nikon D600, Sigma 105mm lens, ISO 1250, f/13, 1/500″ exposure. 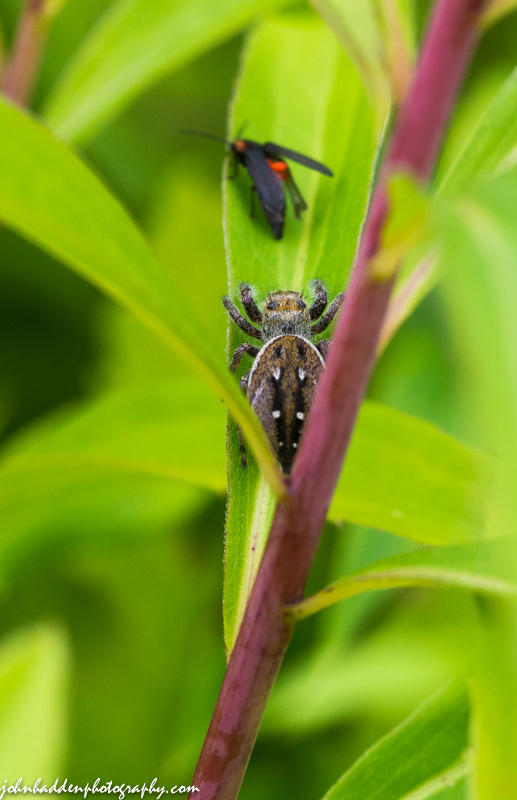 A jumping spider stalks its prey in the front field. This morning in Huntington at 7:05AM it’s currently 63 degree under overcast skies. Winds are calm. Relative humidity is 99%, dewpoint 62, barometric pressure 29.69” and falling rapidly. We picked up 0.09” of rain overnight. Yesterday’s high was 77, and the overnight low was 56. We’re into an active weather pattern for the next 46 hours courtesy of an advancing low pressure system and attendant warm and cold fronts. A line of showers and thunderstorms is currently moving across the St. Lawrence Valley of and western New York and will cross into Vermont in the next hour or two. Another batch of showers and storms will kick off later this afternoon. Highs today in the mid 70s with south winds around 10 mph. Chance of rain is 80%. Tonight should be partly cloudy until midnight, then becoming cloudy with a chance of showers and thunderstorms mainly until midnight. Lows will be in the lower 60s with south winds around 10 mph until midnight, then becoming light and variable. Chance of rain is 50%. Monday will bring rain with a slight chance of thunderstorms throughout the day. Highs will be in the lower 70s with light and variable winds becoming northwesterly around 10 mph in the afternoon. Chance of rain is 90%. Monday night showers are likely. Lows will be in the mid 50s with west winds around 10 mph. Chance of rain is 70%. Tuesday’s looking partly sunny with a 50% chance of lingering showers. Highs will be around 70 with west winds around 10 mph. Tuesday night should be partly cloudy with lows in the mid 50s. Last year on this date we had a high of 80 and a low of 48. The record high was 98°F in 1949. The record low was 46°F in 2001 (we had a low of 42). The Moon is a waxing crescent, 12 hours old with 0% illumination. Out hunting bugs yesterday in the front field, I came across this jumping spider making its way from leaf to leaf. It stopped only briefly enough for me to get this shot before it hopped on top of the unidentified bug right in front of it. Curiously, it hopped right off the bug immediately afterword having found, I suppose, the insect not to its liking. Nikon D600, Sigma 105mm lens, ISO 1250, f/11, 1/640″ exposure. This morning in Huntington at 8:15AM it’s currently 62 degrees under hazy, partly cloudy skies. Winds are calm. Relative humidity is 98%, dewpoint 61, barometric pressure 29.90″. Yesterday’s high was 78, and the overnight low was 52. You may have noted the hazy skies yesterday. Forest fires way out in Canada’s Northwest Territories were responsible—spreading smokey particulate across much up Canada and the norther tier of the US. We’ll start the day out with partly sunny skies with highs reaching in the upper 70s and southwest winds around 10 mph. Tonight should be partly cloudy with a slight chance of showers and thunderstorms until midnight, then cloudy with showers and a chance of thunderstorms likely after midnight as a warm front crosses the region. Lows will be in the lower 60s with south winds around 10 mph. Chance of rain is 70%. Showers will continue into Sunday as a with highs in the mid 70s and south winds around 10 mph. Chance of rain is 70%. Sunday night should be partly cloudy with a chance of showers and thunderstorms. Lows will be in the lower 60s with south winds around 10 mph. Chance of rain is 50%. A more concentrated low pressure system and a pair of cold fronts will traverse the region Monday brining more steady rain. Highs will be in the lower 70s with north winds around 10 mph. Chance of rain is 80%. Monday night should be cloudy with a 50% chance of rain. Lows will be in the mid 50s. Last year on this date we had a high of 71 and a low of 49. Burlington norms for this date are highs of 81 and lows of 61. The record high was 94°F in 1939. The record low was 45°F in 1976. The Moon is new, 29d 4h old with 0% illumination. 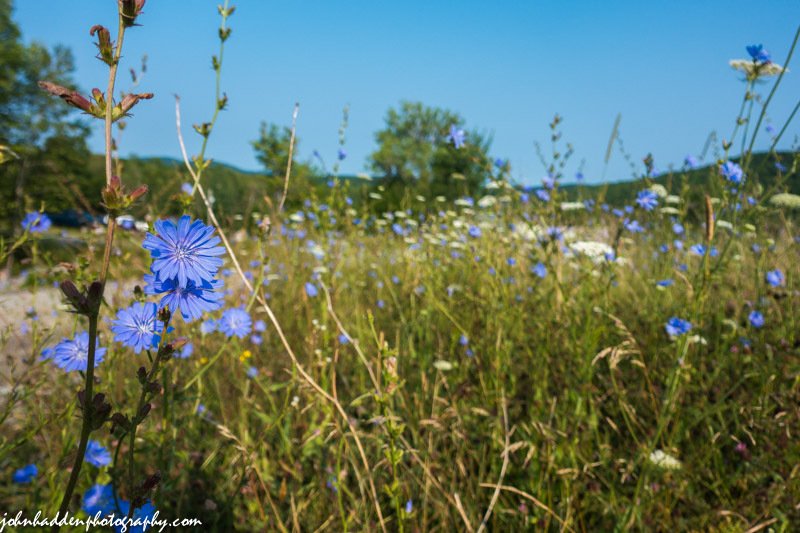 It’s high summer and the chicory and Queen Anne’s lace are blooming. This shot was taken along the roadside on Bert White Road yesterday. Sony RX100 III, ISO 125, f/2.8, 1/1600″ exposure. This morning in Huntington at 6:50AM it’s currently a cool and dewy 51 degrees under clear skies. Winds are calm. Relative humidity is 99%, dewpoint 50, barometric pressure 29.96”. Yesterday’s high was comfortable 71, and the overnight low got down to 48. We’ve got another primo mid-summer day on tap courtesy of broad high pressure stretching from the upper mid-West into northern New England. We’ll see mostly sunny skies today with highs in the upper 70s and light and variable winds, becoming westerly around 10 mph this afternoon. Tonight should be clear with lows in the mid 50s and light and variable winds. Saturday should start out partly sunny with a slight chance of showers in the afternoon as an upper level disturbance approaches from the west out ahead of larger low pressure system. Highs will be in the upper 70s with southwest winds around 10 mph. Chance of rain is 20%. Saturday night showers and thunderstorms likely as the disturbance moves through. Lows will be in the lower 60s with south winds around 10 mph. Chance of rain is 70%. Sunday showers and thunderstorms likely as the more complex low and associated fronts move through. Highs will be in the mid 70s with southwest winds around 10 mph. Chance of rain is 70%. Sunday night should be partly cloudy with a chance of showers. Lows will be around 60. Chance of rain is 50%. Last year on this date we had a high of 71 and a low of 40. We picked up a trace of rain. The record high was 97°F in 1963. The record low was 45°F in 1912. The Moon is a waning crescent 28d 2h old with 2% illumination. 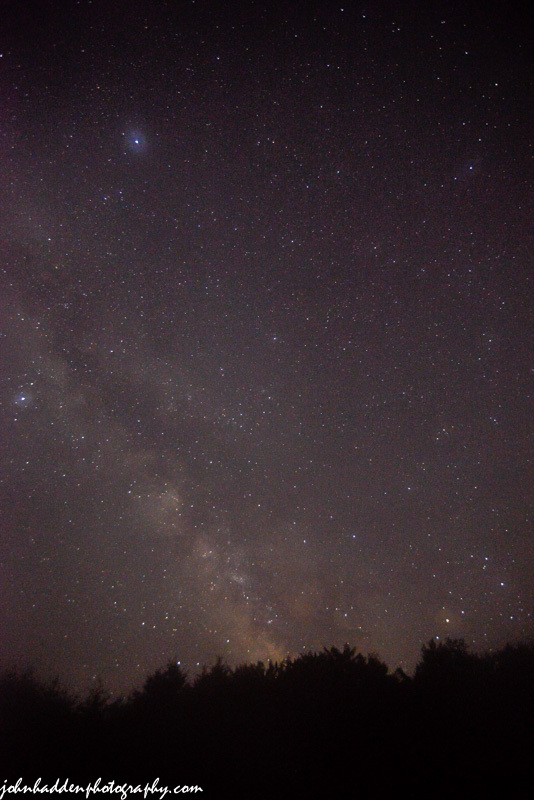 Nikon D600, Nikon 18-3mmm lens @ 18mm, ISO 3200, f/3.5, 20″ exposure. Enter your email address to subscribe to the ESWB and receive notifications of new posts by email.